Noah Jordan joined Rothman Gordon in 2013. His practice is concentrated in the Labor & Employment, Employment Discrimination, and Workers’ Compensation practice groups. Noah provides counsel to numerous local unions in Western Pennsylvania representing professional, para-professional, and non-professional employees on collective bargaining, labor arbitration, and contract administration matters in both the public and private sectors. 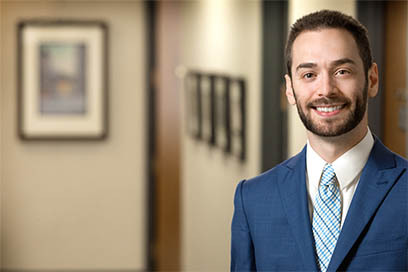 Noah also represents and counsels clients on Workers’ Compensation claims and in various employment matters, including litigating discrimination claims on behalf of employees, negotiating and reviewing separation, severance, and non-compete agreements, and representing parties in unemployment compensation hearings. Noah is a member of the Allegheny County Bar Association and its Young Lawyers’ Division, WPELA (Western PA Employment Lawyers Association), the Southwestern PA Chapter of the Labor and Employment Relations Association (LERA), and the AFL-CIO Lawyers Coordinating Committee. He serves as a contributing editor to the Developing Labor Law, as a Board Member of the Jewish Family & Community Service of Pittsburgh (JFCS) and S.O.S. Pittsburgh, and volunteers with Big Brothers Big Sisters of Greater Pittsburgh. Noah earned a B.A. in English and U.S. History with distinction from the University of Michigan and his J.D. from the University of Pittsburgh School of Law. During law school, Noah served as a teaching assistant for Legal Writing courses, Topics Editor for the Pitt Journal of Environmental and Public Health Law, and president of the Pitt Legal Income Sharing Foundation. Before joining the firm, Noah interned with Neighborhood Legal Services Association and the Office of the Chapter 13 Bankruptcy Trustee for the Western District of Pennsylvania.